A new version of Ecwid (v10.2) has been released. All Ecwid users have been upgraded automatically. In this post we’ll describe what new features have been added and also highlight some features from v10 that we haven’t mentioned in our blog yet. Now Ecwid has a tool that allows you to ask the customer for additional information during checkout. You can enable this feature in the control panel and allow your customers to write notes and add specific information to their orders. After orders are placed they will display as notes in the backend. This feature can be used to collect any specific information or considerations that your customers would like to attach to an order. For example a gift note, a preferred time of delivery, specific options related to a whole order. You can easily change the form caption to better suite your situation. We know that many Ecwid merchants have waited a while for this feature, since collecting specific information related to an order is an essential part of their business. The more detailed information about your customers orders, the better you can serve them, and the more repeat sales you’ll receive. We’re happy to release this important and must-have feature. It can be enabled on the System Settings → General → Cart page, Order comments section. A lot of merchants use affiliate systems and advertising tools (such as Google AdWords) as an additional channel to boost their website traffic and sales. Indeed, they can be very effective. 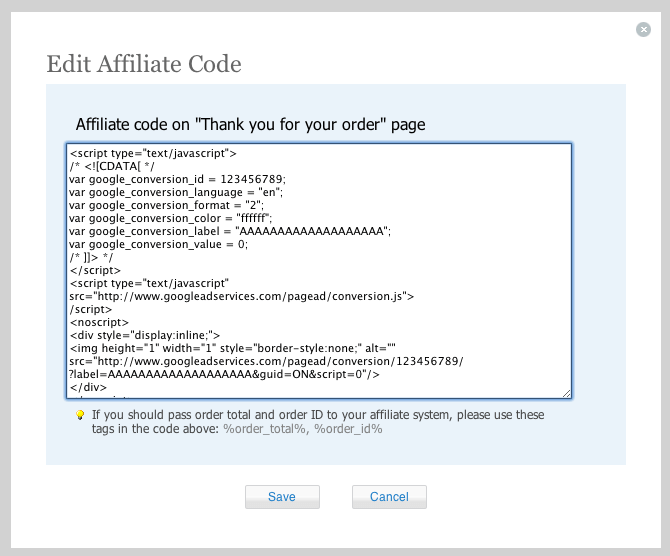 Almost all systems ask to add some specific conversion/affiliate tracking code to your conversion page, also known as Thank you for your order page, i.e. the last checkout page a customer sees when he placed an order successfully. Now Ecwid has an easy way to add such codes. 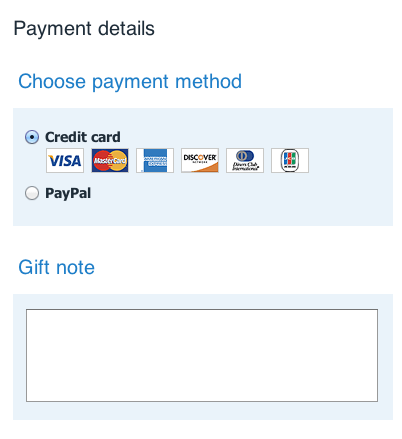 Just open the System Settings → General → Cart page, find Checkout Settings section and enter the code there. Now you can use your Ecwid store with your favorite affiliate system without any issues and get more sales. If you don’t have an affiliate program yet, we suggest you to consider adding it, because affiliates can bring you many new customers. For example check zferral. New Russian payment gateway: QIWI. It’s one of the most popular gateways there. It has low transaction rates, widely used by customers and it’s easy to sign up for a QIWI merchant account. That’s why we think it’s a great option for merchants who’ve just began selling online in Russia. A lot of internal architectural improvements under the hood. These improvements will increase the speed and stability of the Ecwid platform. We’ve updated Ecwid’s Single Sign-on API slightly for better integration with your site’s Sign in/Sign out links. So if you use this API, we suggest to update your integration. New translations of the control panel and storefront. The backend is now available in Spanish and Portugese. Storefronts are now available in Persian, Lithuanian and Macedonian. Ecwid now has 40 storefront translations, that’s a lot! Thanks to all of the volunteers who’ve helped us with the translations. Also we want to describe some new features implemented in v10. You’ve most likely already noticed and used them, but we think that they’re worth mentioning in our blog. Now store owners can view the unfinished sales. These are orders that were started by customers, but were not placed yet. For example you can always contact a customer and ask if he/she has any problems when placing an order. If you for example get an order by phone, you can always convert the unfinished order to a real one manually, by pressing the Place this order button. 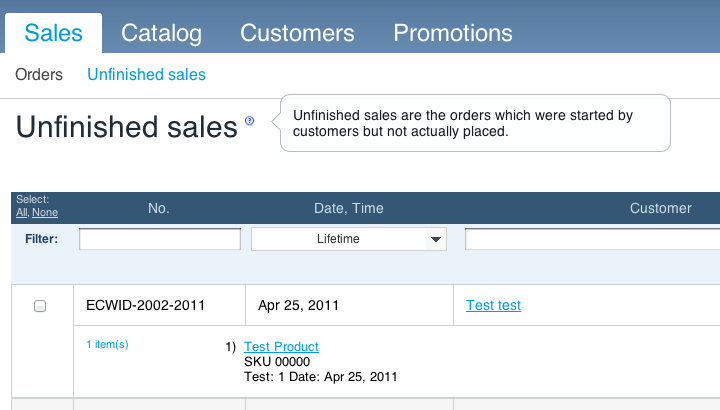 This feature will be very useful for converting unfinished abandoned orders to the real sales. Customers who shop in Ecwid stores have many ways to add a product to the shopping bag. Besides the old-school Add to Cart button on the product details page, a customer can also drag-n-drop a product to the cart or add it from the list of products in the Table view. When these ways are used, the customer skips the selection of product options and the default set of options is added to the cart. Some merchants found this behavior not desirable, because they wanted the customer to be able to select the necessary options to avoid possible incorrect purchases. Now it is possible. 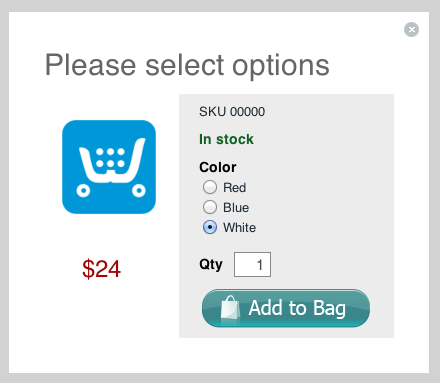 If you enable the Ask customers to select the options button, Ecwid will always ask to select the options before adding a product to the bag, if they aren’t selected yet. 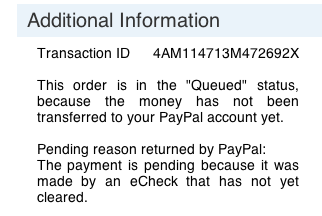 There is plenty of reasons, why an order placed via PayPal has the Queued (pending) status instead of Accepted (order has been placed successfully, money received) one. The most popular reason is that for some reasons PayPal informed Ecwid that the payment was pending or Ecwid marked the order as suspicious. Now Ecwid displays the exact reason in the order details. So you will always know, why the particular order is Queued. A lot of API work has been done. We’ve added many new private APIs for our partners, such as a Single Sign-on for the backend, ability to create and manage stores via API calls, embedding our control panel to external websites. All these APIs allow to smoothly integrate Ecwid with your platform and offer it as an integral part of your business. Some useful changes have been added to the Dashboard page. Now it displays the last 10 orders instead of the last 5. You can also hide the unnecessary sections if you don’t need them. For example if you wish to hide the integration code dashboard since you only need it once (when Ecwid is installed) you can. This way it doesn’t display each time you log in to the control panel. We also added a new section, that displays your Store ID, storage and how much data has been transferred. 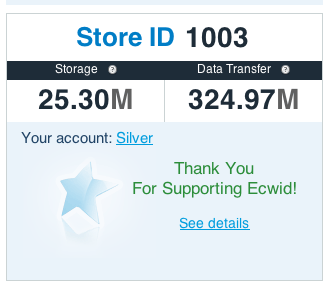 So you have more stats about your store and will never miss your Store ID, which is often necessary when you install Ecwid plugins or ask a question on our forums.